What eyeshadow shade suits me? One of the biggest questions a makeup artist will get asked is, what eyeshadow colour suits me? And let’s face it; walking into a makeup store can be a little daunting and choosing that right shade can seem near impossible. With so many beautiful colours to choose from and so many different types of eye makeup product, how is a girl seriously expected to know what she’s doing? Now there are a few rules when it comes to eyeshadow selection, however I am also a believer that you don’t always need to go by the rules, especially when it comes to fashion. The answer is also not as simple as some may believe, however you can be guaranteed that matching your eyeshadow colour to your eyes is not the way to go! Remember you want your eyes to pop and not to be washed out. Blue eyeshadow that matches you’re blue eyes will wash them out, however that’s not to say you should never use blue eyeshadow. Don’t plaster blue shadow all over the top of your lid and be done with it; use it as a crease colour or in the outer corner and blend with your complimentary colours listed below. The colour wheel is also a makeup artist’s best friend and will give you a fairly clear idea of what colour to opt for. 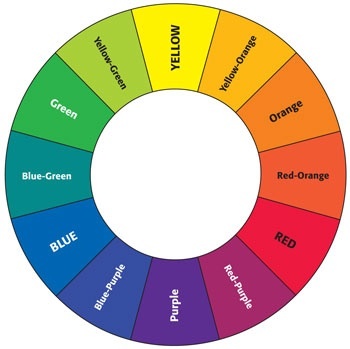 Find your eye colour on the wheel and then refer to the colour that is directly opposite of that colour on the wheel. Brown eyes – the opposite colour on the wheel is blue which translates into navy, teal and neighbouring shades like green and purple. Warm bronze is also lovely. Now all you need to do is choose the product that’s right for you. Stick to the type of product you feel most comfortable applying, or if you’re willing to get a little more creative, ask one of the instore pro’s to give you some tips. Powders are a great all round eyeshadow and blend beautifully. Avoid shimmery shadows on mature lids, as it can really accentuate crepe-y lids and lines. Powders are great for normal to oily skin. Creams are beautiful and look lovely, however are not great on mature skin as they can clump and crease in crepe-y eyelids. You also need to be careful not to apply too much at once. Start with thinner layers and build if you need too. Creams are great for normal to dryer skin types. Paintpots like MAC Painterly or NYX Eyeshadow Base in Skintone can be used as a base to even out skin colour on the lids or use a colour like MAC Groundwork as your base for a brown smokey eye. You can also use white bases to really brighten up a powder shadow. Remember to blend quickly and let dry before starting any powder work. Again like cream shadows, less is more. Pure Pigments are great as an all over lid colour for a dramatic look or a great addition onto the centre of the lid to finish off a look. A brown smokey eye can be finished off beautifully with a gold based pigment placed in the centre of the eye to make it pop. As I said earlier, the rules don’t always need to apply. Try not to limit yourself to only the colors listed. Also before any eye makeup application remember one important rule – prime those damn lids! Eyelids are one of the oiliest parts of the face. Have you ever suffered from slipping/wet looking eyeshadow? Well need I say more? Using a primer will not only help stop the slippery slide, but will also give your eye makeup longevity to get through the whole day.